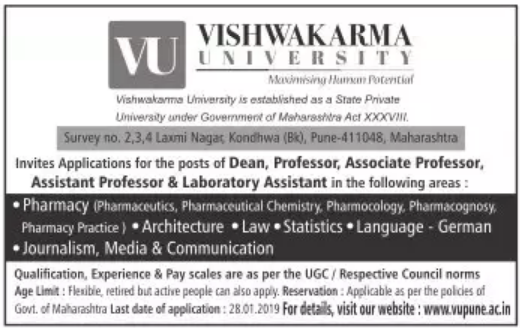 Vishwakarma University, Pune has advertised in the LOKSATTA newspaper for the recruitment of Professor / Associate Professor / Assistant Professor / Dean / Lab Assistants jobs vacancies. Interested and eligible job aspirants are requested to apply on or before 128th January 2019. Check out further more details below. University Profile: Inspired and propelled by social cause and consciousness, Bansilal Ramnath Agarwal Charitable Trust was established in 1975 for social, religious and importantly educational noble initiatives by a Visionary of its kind Mr. Bansilal Ji Ramnath Agarwal. Vishwakarma Group (VI, Group) functions under the framework of this Trust. Thoughtfully selected name “Vishwakarma” means creator of the world – the best known engineer! as per the Indian mythology. The Trust has responded to the changing paradigm of the Country for last 40 years in terms of social, economic, educational and industrial progress. How to Apply: Interested and eligible candidates are requested to apply ONLINE at the link provided below and send print copy of application to the following postal address.